Patrick Canan has been a resident of St. Johns County since 1990. He and his wife Dawn have three children: Slater graduated from St. Augustine High School in June 2012 and is now enrolled in the honors program at the University of Florida; Gavin is a junior at St. Augustine High School and Charlotte is in 6th grade at Murray Middle School. Patrick has a BA degree and a law degree from the University of Florida. He is a former Assistant Public Defender in Alachua and Monroe Counties and Assistant State Attorney/Division Chief in St. Johns County. Patrick is the founder and President of Patrick T. Canan P.A., a litigation firm located at 43 Cincinnati Avenue in St. Augustine. Patrick is a former adjunct professor at Flagler College and substitute school teacher in Oakland, California. 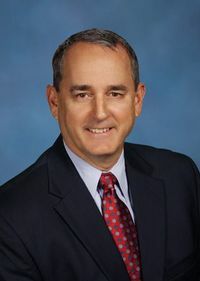 He was an appointed member of the St. Johns County School District Strategic Planning Committee, a group of community leaders and teachers which successfully collaborated to create the District’s five year vision. Patrick is very active in the community having been involved with EPIC Community Services, Investing in Kids (INK), the United Way, the St. Francis House, the St. Augustine Rotary Club and Leadership St. Johns.